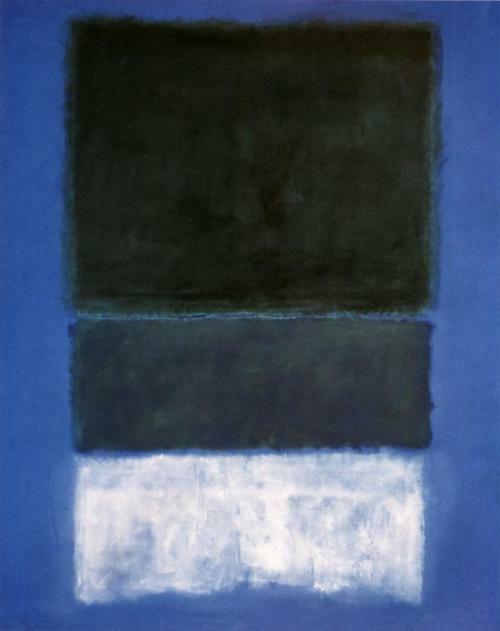 Looking at Rothko’s White and Greens in Blue (1957) is a fascinating activity. On a clear blue background three horizontal fields are placed above each other. At first glance the largest plane seems black, but gradually you start to see that it is dark green. In contrast to this dark plane the white cloudlike plane at the bottom appears somewhat frayed, with the blue of the background shining through. The green middle plane softens the sharp contrast between the dark field above and the nebulous white one underneath. The upper plane keeps me at a distance, the white one pulls me towards itself. This painting, which I saw in Washington, is a religious work to me. 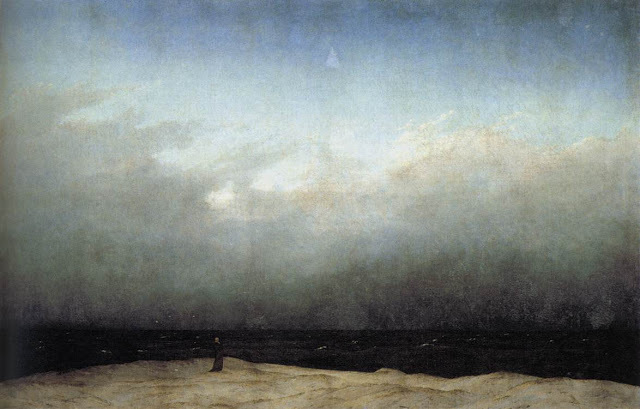 The white plane makes me think of the well-known painting The Monk by the Sea (1808-1810) by Caspar David Friedrich, where a man stands as a minute figure in a huge expanse of sea and sky. It evokes a sense of infinity, of the transcendent and sublime. Rothko’s painting also evokes a sense of infinity, not by referring to sea and sky, but more directly by means of the three planes on the canvas itself. There is no depiction of nature here, rather a direct experience of the sublime while I am watching. The spectacle becomes even more exciting, when I realize that on the one hand the infinite presents itself as terrifying through the very dark green plane and as fascinating through the white cloudy plane. My gaze is taken prisoner and I can’t seem to pull myself away from the canvas. Do we come to a boundary here beyond which lies a void, the totally unknown? Standing in the Protestant tradition it occurred to me: this is an example of what Rudolf Otto calls the experience of the holy or numinous. On the one hand there is distance, deterrence, and on the other hand attraction. Moses had a similar experience when confronted with the burning bush. He could not come closer to the manifestation of God, while at the same time he was pulled in by the voice from the branches. How can an abstract painting like this one be a religious work? Are religious paintings not usually figurative while portraying Christ, Mary or a biblical scene? That is true, but our painting depicts God. Can we portray God? What about the biblical commandment ‘You shall not make for yourself an idol’ (Exodus 20:4)? And think of the dispute within the old church about images. During the Fourth Council of Constantinople (869-870) the church underscored an earlier decision to allow the use of images, provided that the Divine would be clearly distinguished. I am a proponent of the religious use of images (sculptures, frescoes, paintings etc.). It surprises me, however, that also God himself is portrayed in the Christian tradition, such as in Masaccio’s Holy Trinity (1425-1427) in Florence. God is rendered here as an old man with the dove of the Spirit and Christ on the cross beneath him. The depiction of God the Father has been defended on the basis of the book Daniel. In a dream Daniel saw an ‘Ancient One’ on a throne, ‘his clothing was white as snow, and the hair of his head like pure wool’ (Daniel 7:9). This, however, does not convince me as God rejected Moses’ request to see his majesty:‘You cannot see my face; for no one shall see me and live’ (Exodus 33:20). Looking at White and Greens in Blue by the Jewish artist Rothko I realize again that God cannot be portrayed. A painting like this stands in the iconoclastic tradition. Here the experience of the holy God is evoked in an iconoclastic way. On the one hand I experience the distance between God and me through that large upper plane. On the other hand I am attracted to him through the white plane. Indeed, this painting speaks to me as the impossible depiction of the holy God that no human can see and live. Mark Rothko: White and Greens in Blue, 1957, oil on canvas. National Gallery of Art, Washington, D.C.
Mark Rothko (1903-1970) was born in Latvia. His parents emigrated to the US in 1910. He was raised an Orthodox Jew, but later distanced himself from the synagogue. In his work he wanted to convey the ‘human drama’ or the tragedy of human existence. To this end he based himself on old Greek myths, but also used Christian symbolism of life and death in works like Baptismal Scene (1945), Gethsemane(1945) and Entombment (ca. 1946). Rothko moved through many artistic styles until reaching his signature 1950s abstract expressionistic style of soft, rectangular forms floating on stained fields of colour. Heavily influenced by mythology and philosophy, he was insistent that his art was filled with content and brimming with ideas. A fierce champion of social revolutionary thought and the right to self-expression, Rothko also expounded his views in numerous essays and critical reviews. Wessel Stoker is Professor Emeritus in Aesthetics at the Free University of Amsterdam. He has written several books, of which the latest has been published in English: Between Heaven and Earth: the Spiritual in the Art of Kandinsky, Rothko, Warhol, and Kiefer,Amsterdam/New York: Rodopi, 2012. See www.godgeleerdheid.vu.nl/stoker.